Michael Gamstetter is an old friend of ours who is about as crazy for road bikes as anyone we know. Not crazy about the latest and greatest, but about the old days of racing and the racers who made the sport great. Apparently, Michael has dreamed up a new challenge for himself that he thought RBA readers would be interested in hearing about …it’s all about being crazy for cycling! Italian, cycling, superstar Andrea Tafi and I have very little in common. The one thing we do share is a birthday. But we weren’t just born on the same date. We were born the same day—May 7, 1966. In addition to being birthday twins, we also share a passion for cycling and the Spring Classics—Paris-Roubiax in particular. And next April, at 52 years of age, we both plan to finish riding the Hell of the North in the Stab Velodrome in Roubaix. Tafi plans to do it as a member of the professional peloton while I will do it as one of the thousand of amateurs who will ride the Paris-Roubaix Challenge. Tafi, who last raced Paris-Roubaix in 2005 at 38 years old, hopes to be among the racers who will finish the grueling race 20 years after he won it in 1999. While I also was at Paris-Roubaix in 2005, and, as a journalist, rode a handful of cobbled sections of that year’s race, I simply hope to finish the 172-kilometer (109-mile) Challenge version of the Hell of the North. And to make it more interesting (i.e. stupid), I plan to ride a bike that pays homage to another racer who found success at Paris-Roubaix—Roger De Vlaeminck. I’ll be riding a beautifully restored Gios Torino similar to the one Roger De Vlaeminck rode to 7th place in Roubaix in 1973. But the bike’s frame is no ordinary Gios Torino. It’s the actual frame raced by Julien Stevens in 1972 when he and De Vlaeminck were on the Dreher Team. When Dreher became Brooklyn in 1973, the frame was resprayed Gios blue and raced for the first part of the season. It may even be the same frame Stevens rode to a 20th place in Roubaix that year. I bought the frame in 2017 and restored with correct Campagnolo, Cinelli, Mavic and other parts and accessories to ride Eroica California in 2018. I had planned to put the bike into semi-retirement, but after too many hours watching A Sunday In Hell and fantasizing about racing during that era, I’ve decide the 47-year-old bike should make one more visit to the cobbles of Norther France. Besides the bike, I will ride in accurate, reproduction, Brooklyn kit, including the unique 1973 jersey, wool shorts and 1970s Sidi shoes. Due to the regulations of the event, I will be wearing a modern helmet, however. The Paris-Roubaix Challenge will be part of a vintage triple I hope to complete this spring. The week prior to Paris-Roubaix I will ride Eroica California on a 1984 Serotta-built Team 7-Eleven Murray in 1984 7-Eleven kit. 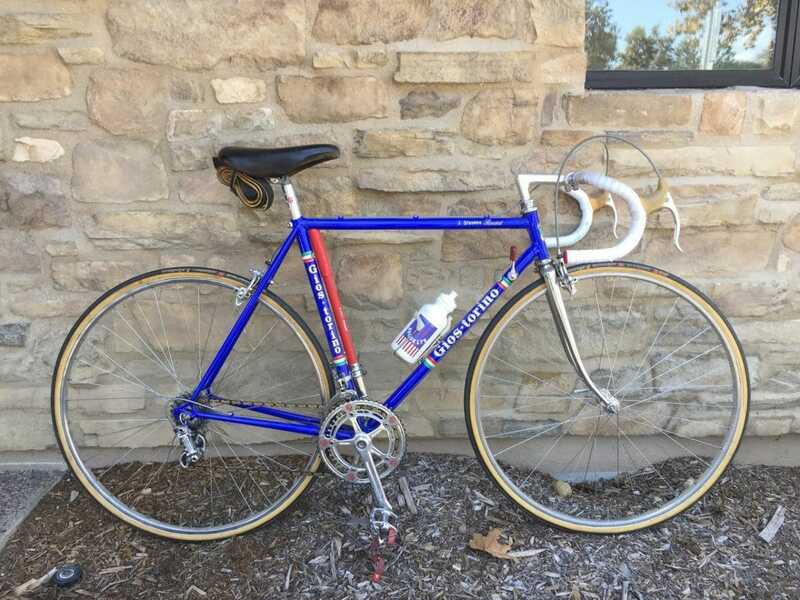 And in mid-May, I hope to do the Belgian Waffle Ride on a 1990 Greg LeMond Z Team bike with a vintage RockShox Paris-Roubaix fork. Between now and then, I have a lot of training and prep to do. I’ll also be posting updates to my blog and on social media. Michael Gamstetter has been riding and racing bikes since 1978, including BMX, road, mountain and cyclocross. He achieved a lifelong goal of joining the bike industry in 1990 when he joined the editorial staff at Japan Cycle Press. In 1994, he joined the editorial staff at Bicycle Retailer & Industry News, where he was editor-in-chief when he left in 2005. Since then, he has worked in the bike industry as a product designer/industrial designer, brand manager, marketing manager and bicycle and component product manager. He currently puts his product and graphic design, writing and marketing skills to use for several bike and fitness industry clients. He also owns and rides a variety of vintage road, mountain and BMX bikes.